This is a super fun recipe for the kids and for the adults who grew up eating hot pockets during those late college nights. This is a very versatile recipe and you can easily add in a large range of fillings to satisfy anyone and everyone from the meat lovers to the vegetarians to the plain janes who just love plain cheese. 1) To make your dough combine your water, sweetener, and yeast in a mixer or a large bowl and let sit for 10 minutes. Add in your flour and oil and mix until your dough forms â€“ your dough should not be sticky. Knead for a few minutes then oil your bowl, place your dough in the bowl, cover with a towel, and let sit in a warm place for ~1 hour or until your dough doubles in size. Protip: To help my dough rise, I preheat my oven to 350 degrees F and place my bowl on top of the oven. 2) While your dough is rising, prepare your fillings. Slice your cheese, prepare your chicken, cook your veggies, etc. Set these aside. 4) Fold up the ends of the dough so your fillings are completely enclosed (will resemble a very large burrito). With a sharp knife, cut your â€˜burritoâ€™ into equal pieces. Pinch the dough around the openings where you cut so your fillings are enclosed. Be sure to pinch the dough closed as best you can so your fillings donâ€™t fall out when your hot pockets are baking. 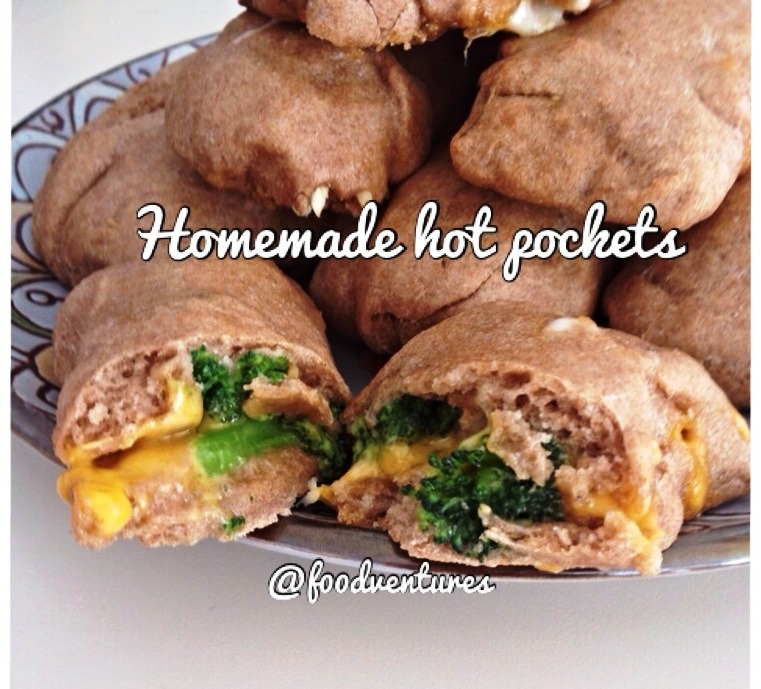 5) Place your hot pockets a couple inches away from each other so they have room to expand in the oven. Bake for 15 minutes. For a â€˜shinyâ€™ finish on top, combine an egg white and a few tablespoons water in a small bowl and brush on the tops of your hot pockets at the 10 minute mark.